This is a gorgeous photograph! Are you still using the P&S? lf so, it's a very good one! Hope you're doing well, my friend! now you've reminded me that my grandparents had an agave cactus in their garden...i recognize it now but didn't know that's what it was, or cared when i was a kid lol...now that we use agave here at home it's nice to know where it comes from! Love succulents!! 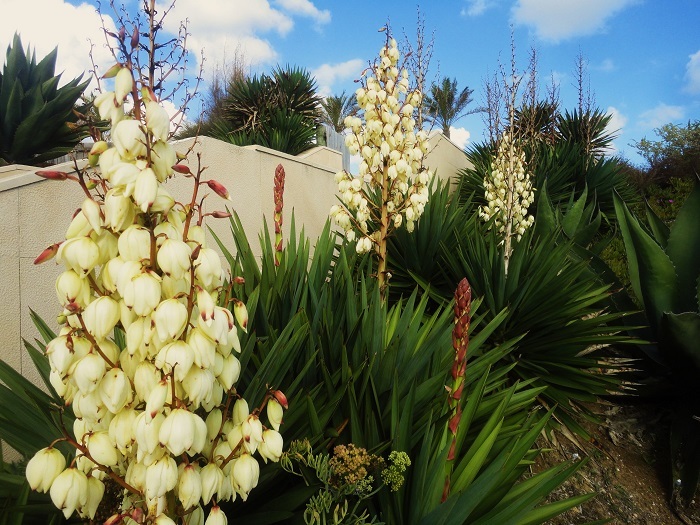 I never had flowers on my Yucca's, what a pity, they are so beautiful!! That's a beautiful shot that reminds me of the yucca garden at the Desert Botanical Garden. I love it when they are all in bloom. This is a gorgeous shot, JM! What a beautiful, superb capture, Jose!! Love your composition and skies -- as always!! Hope your week is going well!! Enjoy!!! The composition with the beautiful blooms in the foreground and the blue skies in the background is a winner. We have this type of yucca here in East Texas as well as in Phoenix which I am returning to very soon. Love the yucca flowers--- don't care for the way they smell, though. Lovely shot. Beautiful! So different to my eyes, Jose. Linda foto, ainda mais perto de uma praia! YOU have eyes for beautiful plants and beautiful, aesthetically pleasing things. I enjoy that.